Entire WPF's objects model image. After coding WPF for some years now, I came to the conclusion that to truly understand WPF I needed to see the "whole picture." In some instances, for practical reasons, such as figuring out why thing did not happen as I expected. For example: "Why doesn't this object accept dependency-property? Ah. It isn't derived from dependency-object." Or strange behaviors from objects that I eventually figured out derived from "Freezable," and so on. But for more abstract reasons, I wanted to understand the framework as a whole. So I searched the internet and only found this poster which is very nice, but it is only partial and not up-to-date. So I turned to my company's MS-customer support for help. After a couple of months they gave me an answer: "We can't help, we don't have such a poster." The last thing left for me to do was to create this poster myself (not manually, but by writing an app that produces it). 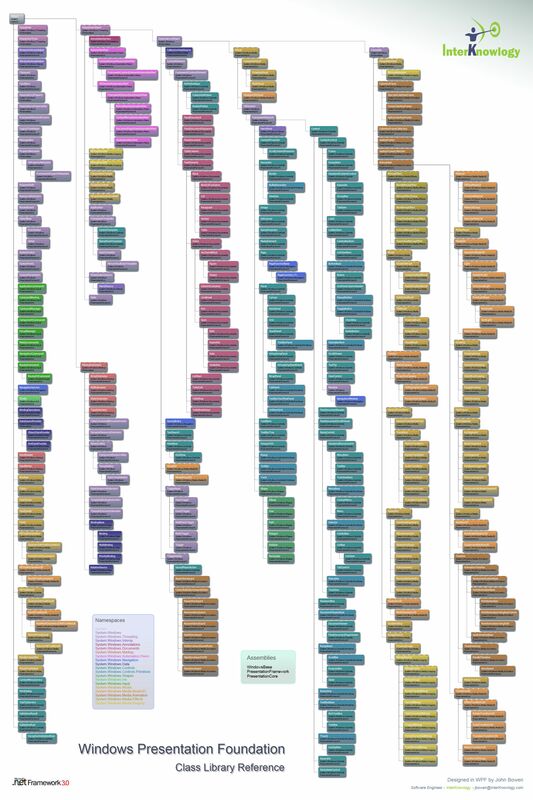 I had a vacant 1.70 x 2.30 meter wall in my office so my task was to fit this very large schema into it. After I finished and was content with the outcome, I thought about sharing it with other WPF programmers out there. Although it's an unusual size (to say the least) I truly believe that it is a great tool for any WPF programmer even if on a monitor. Dropbox link no longer works. Re: Dropbox link no longer works. I've contacted CP's editor who fixed it. Hope you'll find this poster useful as i do. Though it looks complex, I am sure you have put lots of effort for preparing this. Thank you so very much for taking the time to vote & complement. For the short time i'm using this poster it has proven to be a very valuable tool for a daily basis WPF development. I hope you and others will benefit from it too. Wheres the code you used to generate the graphic.